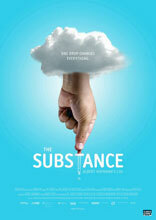 Martin Witz's THE SUBSTANCE: ALBERT HOFMANN'S LSD is an informative and entertaining investigation into the history of a drug so potent that mere fractions of a milligram can alter a subject's perception of reality. Viewers learn how Hofmann's discovery became the subject of 1950's Cold War experiments by the American military and the CIA, who saw LSD as a potential weapon. Meanwhile, international psychiatrists and consciousness researchers tried to unlock the drug's medicinal possibilities, wondering whether it might be an effective tool for contemporary psychiatry or neuroscience. In the early 1960s, Hofmann's "miracle drug" escaped from the lab. The psychedelic substance appealed to the counterculture, whose members saw LSD as fuel for social and political revolution. Could spiritual peace be achieved at the flick of a chemical switch? The notoriety and sense of possibility surrounding LSD persist to this day. Decades after it first began to appear on international anti-drug blacklists, doctors and researchers have resumed exploring potential medical and therapeutic applications for the drug. Chock-full of rare archival footage of LSD-defining celebrities from Timothy Leary to Jimi Hendrix, as well as interviews with principal historical witnesses-including scientists, psychiatrists, and Hofmann himself, interviewed just before his death - THE SUBSTANCE: ALBERT HOFMANN'S LSD follows the story of LSD on a fascinating historical, scientific and cinematic trip. An exploration of the latest scientific discoveries about the human brain, an inner cosmos as complex as the universe itself. The life and work of one of the most important neuroscientists of the 20th century, Nobel Prize winner Eric Kandel.